Imagine you buy a coffee maker based upon your budget and in the long run realise that the features do not suit your needs and requirements, it would only be a waste! Getting the right coffee maker is a serious business. Being a coffee enthusiast, you would not want to compromise on the taste of your coffee and its brewing process. 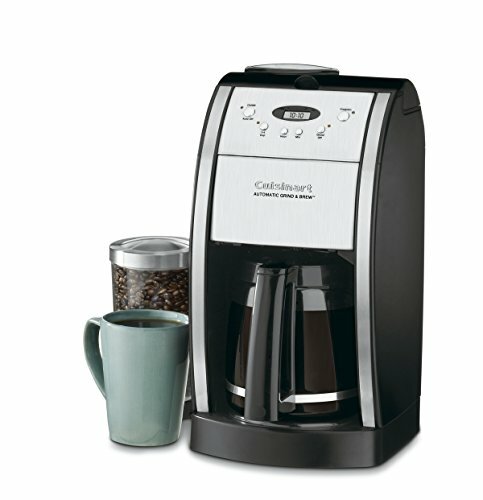 Trust us when we say, if you are in the market buying a coffee maker, buy a brand new Cuisinart coffee maker. 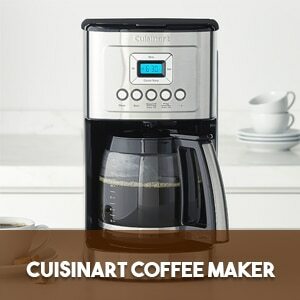 In this article, we have analyzed some of the most popular and most trusted Cuisinart coffee makers that can help you purchase one for yourself as well. Cuisinart has a number of coffee machines to choose from but we have selected the best 10 coffee makers for you. Whether you want to make 14 cups, 12 cups or a single cup, Cuisinart coffee makers deliver the best in quality with customizable settings. Cuisinart coffee makers come as mid range options and are powerful enough to brew tasty cups of coffee, with reliability and ease of use. Cuisinart coffee makers are a mark of excellent specification and humble price along with convenience. 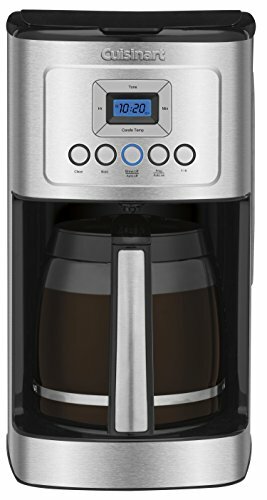 Best Cuisinart Coffee Makers – The Winners! If you are looking for a good quality coffee maker that also fits within your budget, then this coffee maker is the right option for you. It comes with a programmable digital clock that has a 24 hours setting, an automatic shut off feature, a self cleaning option. It also has a classy design and you are bound to fall in love with it, which is why we believe it will be a smart choice for you. It is also one of the most popular coffee makers in the market right now. The best thing about a Cuisinart Brew Central is that you can enjoy a cup of coffee while it is still on the brew cycle. The brewing process can be stopped and restarted without any kind of mess. You can even schedule your brewing process 24 hours in advance. This is a great add on feature as it helps you to manage the coffee machine easily. You can program the coffee machine to shut off anytime within 4 hours once you have already brewed coffee with it. The coffee machine can take care of itself even if you are away for a long time, so you do not have to worry about it. With the preset timer, you can keep your coffee warm for upto 4 hours. The third best feature of this coffee maker is its audible alert tone which will signal you when the brew cycle ends. When you hear the beep five times it means that the process of brewing has stopped. 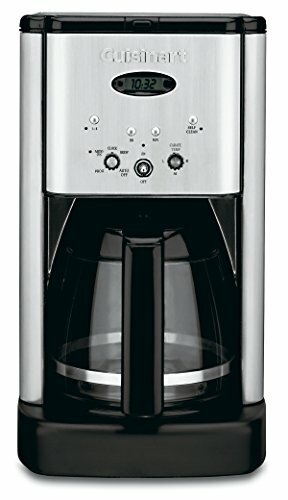 Like most drip coffee makers, the Cuisinart coffee maker comes with a glass carafe and it has a capacity to brew 12 cups of coffee at a time. It also further comes with a nonstick heating plate. You can easily adjust the heating level of the plate so that the taste of your coffee does not go bitter while the plate also remains warm. The Cuisinart DCC-1200 comes with a permanent gold tone filter for your coffee grinds. This helps to give you maximum flavour extraction so you do not have to use paper filters everytime. Cleaning this coffee machine should not even be a matter of concern for you when it comes to the Cuisinart DCC 1200 as it has a self cleaning cycle of its own and you can conveniently keep your coffee pot free of any kind of calcification inside of the water reservoir. If you are looking for a mid priced coffee maker that is easy to operate and is versatile in its features for producing good tasting coffee, then this coffee machine is the ideal choice for you. It comes with convenient features such as hands free brewing and cleaning and drip free spout which prevents any kind of mess. It further comes with an adjustable warmer temperature control to boost your mornings. This coffee machine has the ability to reach a temperature of 200 fahrenheit, which is ideal for making a great cup of coffee. The water heating system is great for keeping your coffee warm for longer period, allowing you for longer extraction. With that temperature and lengthier extraction, you can brew rich coffee with very less waste. The hot plate warming of the carafe can be adjusted according to low, high or medium setting. Choose the high setting, if you like to add cold milk to your drink. Use the lower setting if you like your milk warm as well. This coffee machine comes with 14 cups that can be used for personal drinking option or for large gatherings. You can make 4 to 5 ounces of coffee per cup. This means in total you can make 70 ounces of coffee which is equal to 9 cups of serving. The Brew Pause technology helps you in pouring coffee without the spout. This is helpful for those with larger families so that all members can pour coffee whenever they want. The charcoal filtration system helps to remove all impurities and chlorine from the water and the grinds. It further helps to keep the calcium carbonate in the mix at the minimum level. One of the best features of this coffee machine is its hands-off brewing and cleaning option. You can set the machine to turn on and start brewing whenever you like. You can also program it to turn itself off when it is not brewing coffee for a long time. It can even self cleaning itself so all you need to worry about is cleaning it on the outside. 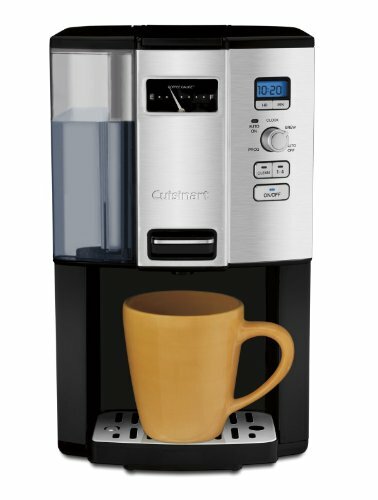 The Cuisinart DCC-3000 is a great option for those who like to save time in brewing coffee. It comes with programs such as auto shut-off, and brews for you great tasting coffee at an affordable price. This machine is ideal for those who like to sip coffees on irregular basis through the day or those who do not think much about filters and carafes everytime they brew coffee. This mid-ranged programmable coffee brewer is great for domestic use and delivers to you instant coffee. It uses coffee grinds, unlike other standard carafes that use K-cups or capsules so it is cheaper at price. You can dispense one cup of coffee at a time. All you need to do is press the lever for the amount of coffee you want in your cup. The charcoal water filter helps to maintain the taste of your coffee, while the gauge lets you know how much coffee is left in the reservoir. This coffee maker comes with a reservoir rather than a carafe and is more of a dispenser in its design. The process of brewing happens in the enclosure of the brewer and you can store upto 12 cups of coffee in the reservoir. It can dispense one cup of coffee at a time but make sure you do not let the coffee sit in the reservoir for too long or else the taste will get stale and bitter. On the front side of the machine is a fuel gauge which displays the amount of coffee that is left in the reservoir. The insulated reservoir does not have a window but you will be notified of the amount of coffee left in it. Like most other Cuisinart coffee makers, this coffee maker too has the programmability feature that helps you set the coffee maker to brew coffee 24 hours in advance. If you need only a few cups of coffee, say 1-4 cups, you can optimise the water temperature and steeping time for lesser load. You can not just program the brew cycle but also decide how long you want the internal heater to be on. You can decide when you want to turn the machine off for up to four hours after the brewing is completed. As usual, you will hear five beeps which means the machine has finished brewing. With a function knob, you can easily switch the timer task. It does not matter of you want one cup of coffee or an entire pot, the function knob lets you program the brewing cycle. If you are looking for a coffee maker that is elegant and also saves you space, among other attractive features, give this coffee maker from Cuisinart a thought. The Cuisinart DGB-550BK comes with a grinding assembly and a two-step filter system that ensures that your coffee tastes good every time you brew with it. It comes with attractive features such as 24-hour programmable timer, brew-pause function and a lot more. The Cuisinart DGB-550K comes in a shiny silver and black plastic look. It is compact in its size with a dimension of 18 x 12 x 10 inches. So you can easily place it anywhere in your kitchen countertop. The machine is made of steel and plastic so the outer construction is sturdy enough to make it last long. 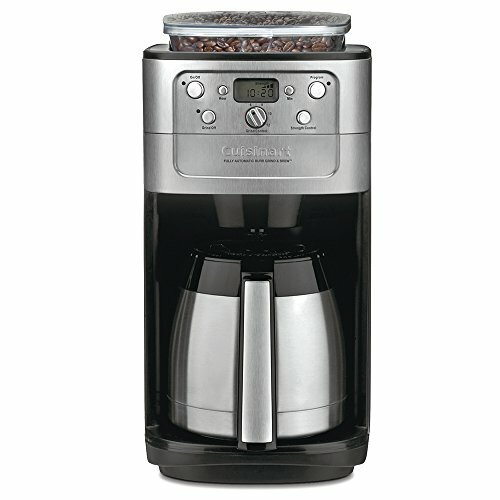 The Cuisinart DGB-550K comes with an in-built grinder to process coffee beans. You can grind coffee beans at the comfort of your home, and you can enjoy the natural feel and aroma of freshly grounded coffee beans. The grinding will automatically begin just before the brewing starts so that you can ground fresh coffee beans for your coffee. The grinding chamber is separately allocated so you can add or remove coffee beans as quickly as you want. You can even adjust the levels of grinding depending on how light or strong you need your coffee to be. If you want your coffee to be free of bad odor from water or other impurities caused by chlorine, this coffee machine is ideal for you. You do not even need to filter the water before pouring it in, because it comes with a two-step filter system: the permanent gold tone filter and charcoal water filter. The Cuisinart DGB-900BC is an all-rounder coffee maker which comes with a built-in grinder and a lot many user friendly programming options. It allows you to pamper yourself with on-demand, programmable grinds to ensure that you only get freshly made coffee. To add to this, the three-option strength selection feature allows you to customise the coffee maker in such a way that you get exactly the type of coffee you want. For home use, the 24 hours programming is great, while for office use the 12 cup carafe size works perfectly. So it depends on you how you want to use it and where. You can basically make coffee any place you want with this cuisinart coffee maker if you and the people around you are really serious about their coffee and grinds. The permanent and charcoal filter ensures that every time you brew coffee it is free of grains, odd taste and is fresh. Yet again, you have the “brew pause” feature that lets you put to pour for yourself a good cup of freshly made coffee while the process of brewing is still going on, for those times when you desperately need a cup of coffee. The thermal carafe is insulated properly for times when you want to keep your coffee hot for a longer period. These up-to-date features of this cuisinart coffee maker makes it one of the best coffee makers in the market right now, and is definitely a steal-deal. If you use a Cuisinart coffee maker, you can benefit from its 24 hours programmable feature, wherein you can set the time for brewing your coffee and let the machine do the rest for you. Just pour the coffee grinds in it and check the level of water in it and then set the program for it and you can enjoy hot cup of coffee whenever you want through the day. This is an excellent feature for those who are always in a rush and want their coffee at the very instant. Cuisinart’s trademark feature is the Brew Pause option. In this feature, you can stop the coffee flow from the basket every time the carafe is removed from the heater plate so that you can enjoy coffee in mid-brew. This means you can safely pull the carafe out of it so that the process of brewing stops and you get a coffee cup everytime the cycle ends. This will make the process of brewing stop every time you return the carafe to finish it. The one thing that you need to keep in mind with this feature is that there will be a difference in the coffee flavour when having one at the end of the cycle versus one at the beginning of the cycle. Moreover, the coffee found at the bottom of the carafe will be stronger than the coffee at the top. However, you can stir to blend the flavours. You can program the coffee maker in such a way that it shuts off as soon as the process of brewing stops, which is anytime between 0-4 hours. In case you are in a hurry for office, you can easily set the time and it will shut off in itself. There will be five beeps you will hear which means your coffee is ready. The heater plate which is adjustable helps you in setting the warmer to the temperature at which you want the brewing to begin with. This is a great feature for coffee enthusiasts who do not like their coffee to be overheated or under heated. This feature helps you to decide if the heat is high, medium or low. You could choose high setting if you want stronger taste to your coffee, and you could go for low or medium setting if you have brewed less coffee and do not want the burnt taste to your coffee. The gold toned permanent filter and the charcoal water filter ensures that your water is pure and does not have a taste to it. The water and coffee is refined so well that everytime you brew with it you are bound to get fresh, smooth and tasty coffee. Most of the Cuisinart models have a self clean feature, which eases the pain of manually cleaning the inside of the coffee maker. All you need to worry about is cleaning the outside of the coffee maker and the thermal carafe. If your machine is made of stainless steel you can use a sponge and clean the surface yourself. The self cleaning feature is easy to use but do not forget to read the user’s guide before putting it to function. Cuisinart coffee makers come with a three years warranty, which is like an entire lifespan of a coffee maker if you use it religiously at home. Most coffee makers come with a warranty of a year which is what sets this brand apart from the rest. My name is Francisco Ashford and I am a food blogger based out of Sacramento, California. After struggling for years with an eating disorder, I have finally learnt the art to live a life of health and wellness. My vision behind running this coffee blog is to inspire and educate readers about "Coffee".